I have not messed around much with the backdrop, I did start pulling it off by just running my hand under it and I got a huge corner of it up. I also have not done any scenery work for a while that involves large amount of water, nor have I had the layout lights on for long periods of time, and the backdrop seems to be settling back, not as flat as new but the huge bubbles are laying flat again. I wonder if the paper absorbed some of the moisture from doing the scenery and expanded, now that it is drying out maybe it is shrinking back to normal size. I also wonder if it may have been caused because I installed the backdrop the day it came and it never acclimated to my layout room. I have prints for the rest of the layout that I have not installed yet because I don't have time, they have been in the room for over a month, maybe they will be all settled in. also, I talked to TCS and they are replacing the burned out decoder, they have no explanation but they have a one year no questions asked return policy. So that made me feel much better. I ran trains the other day for the first time in a while and I have been chasing tight gauge issues everywhere. This winter has been tough this year in Minnesota, the fourth coldest ever on record with about 50 days below zero degrees F, there were days my furnace never shut off, and because of the temps and the furnace running the air is extremely dry. My layout shrunk up so much that I could run trains across my drop bridge because there was too much of a gap. I have a rule to never lay track in the summer here because it gets really humid and the wood expands a lot. 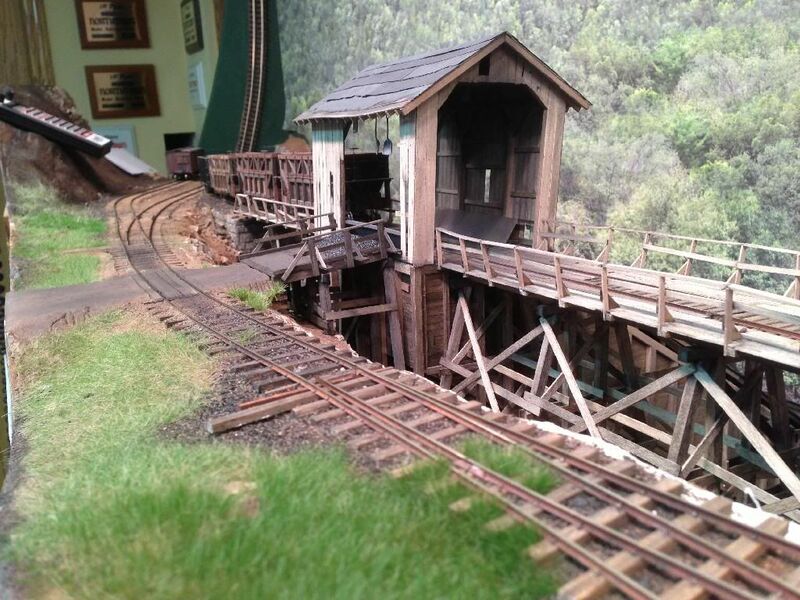 If you lay rail in the summer you will have tight gauge issues by the middle of winter when the layout dries out and the wood shrinks. I find it better to lay rail in the winter so when the layout expands in the summer you just have small gaps at the rail joiners. Well...I ignored my own advice and laid track last summer, my friend even reminded me of my own rule and I said "I am leaving gaps", however it was not enough and I have been sliding back rail joiners all over to shorten and pull back rails. I finished them all this morning and things are running good again. normally I run a humidifier all winter but this year it got so dry we moved it up by the bedrooms because we all got sick of waking up with bloody noses. Tell me again why I live in a place like this.....besides the good fishing. things are looking up here on the Creeker, the backdrop seems to be better. I pulled up the bottom (the top was glued too good to pull up) and taped it up, then I laid down some newspaper and gave a good coat of Super77 to the back of the backdrop print and a second coat to the backdrop itself, then I waited a little over 10 minutes and pressed the backdrop back down, it is mostly flat now. I think my problem I had was not enough glue, only applied glue to one item (the back of the print) and I stuck it down right away. I had never used Super77 and I did not realize that you have to wait longer than I did for a really good tack. Also, new WOW decoder back in shay, so far so good, they have no clue why it burned out. The new decoder is version 3, which seems to have some more sounds loaded. 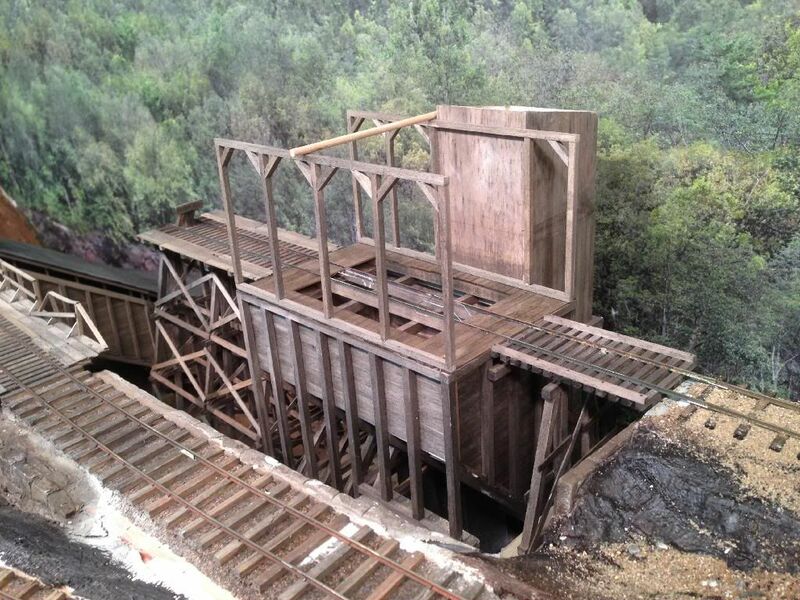 As far as progress, the second dump trestle is installed and working, dumped the first load of coal in the coke coal bin yesterday. I will get photos soon. been working on scenery. I am trying the spray glue and grass cigar method that they use on the Ruphe and Tumbelle and that Joey used on his Spruce Coal and Timber. My first try was pretty much a disaster, again I think I did not wait for the glue to set long enough. On the Ruphe and Tumbelle video they said to wait 10-15 seconds, so I did, and it did not work. Then I watched Joey's video and he said wait 10-15 minutes, which I did on my second try but I still had some issues, but it was better, I'll keep trying. Glad to hear that things are looking up. I've had some issues with decoders and brass engines. Usually while testing, some loose wire or connection that hasn't been covered yet touches something and kicks the decoder. With Tsunami's there is a breaker that they can reset at the factory, so no major losses. Still never exactly sure what happened but its always happened while testing the decoder, fit, etc. rather than afterwards. I've used the technique you mentioned as well. With some success. I think I followed Bill Kerr's instructions. He was an On2 modeler. I'll send them when I find'em. Hey, let me know if your still interested in heading south this summer. My daughter was home for the weekend and she was looking at the layout. I showed here the weed technique and she gave it a shot and she got it to work and showed me what I was doing wrong. We just tried a test patch and I will take what I learned and apply it to the layout. meanwhile, I am still playing with my Grassmaster and did a few more small patches with some different lengths and colors, I still need to learn more about mixing colors, I got the new batch to even green. I also did a test area with grass growing around ties and between the rails, which worked pretty good, I was surprised. also, been working on the loading shed over the coke coal bin. 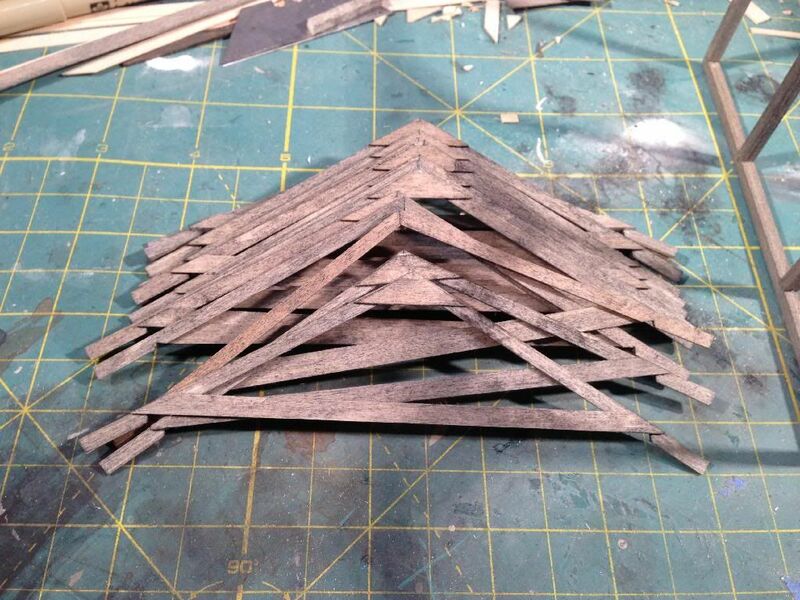 Not shown in the photo are the finished roof trusses. by next week I should have the shed finished and this trestle in full service. Last night I ran the air line over to the shed for the blow down duct. what is the "blow down duct", glad you asked. I am using compressed air with is "piped" to the roof of each shed and discharged out of two strategically placed nozzles. The nozzles aim at the end slope sheets inside the hopper cars. After the cars are dumped the operator gives a quick shot of air and the remnant coal is blown out of the hopper cars, it works well. the air is supplied by a small portable tank that I fill in the garage from my big compressor. I built a small distribution header from 1/8" brass pipe and ball valves that I mounted on the fascia last night to control which dump shed is getting the air blast. I will post photos after the shed is operating. This has been a fun ride so far, I have enjoyed the saga about coal unloading, the backdrop, and now the grass. What distrubs me on the grasses are the colors...I am going fall so I am not using the bright greens. However I do want to modify the colors, I have tried just paint on the brush hitting the tops of the grasses, and I think a bit of airbrush will help that too. The grass experiements do look good though. One think I have to keep telling myself about the grass is that it can be very lush and green in the West Virginia mountains, my guess is because the mountains and trees provide a lot of shade so water is not evaporated as fast. And from what I hear it is really humid there in the summer. I spent some time in Elkins and it was extremely lush. 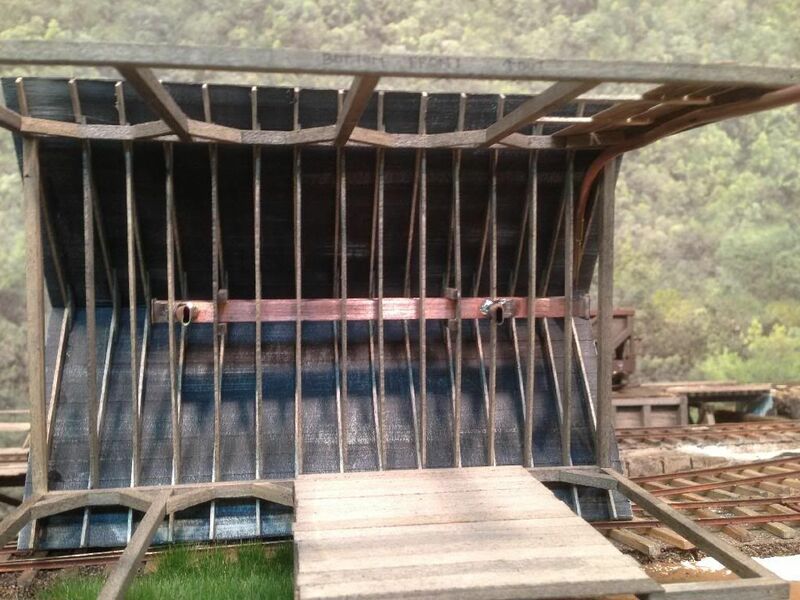 The house I stayed at was built with railroad ties on a lake in the Daniel Boone national forest. They even had a pier with a sauna at the end of it. I was so jealous. I think it was the only private property in the forest. The picture link and your grass pretty much nail it. Great stuff you are doing. Thanks Bill, I hope to get out there this summer to experience it for myself. Here is the picture of the coal unloading controls, sorry it is blurry, I will get a better picture and a new video of it in the next couple weeks. here is what the buttons, knobs, switch, and valves do. 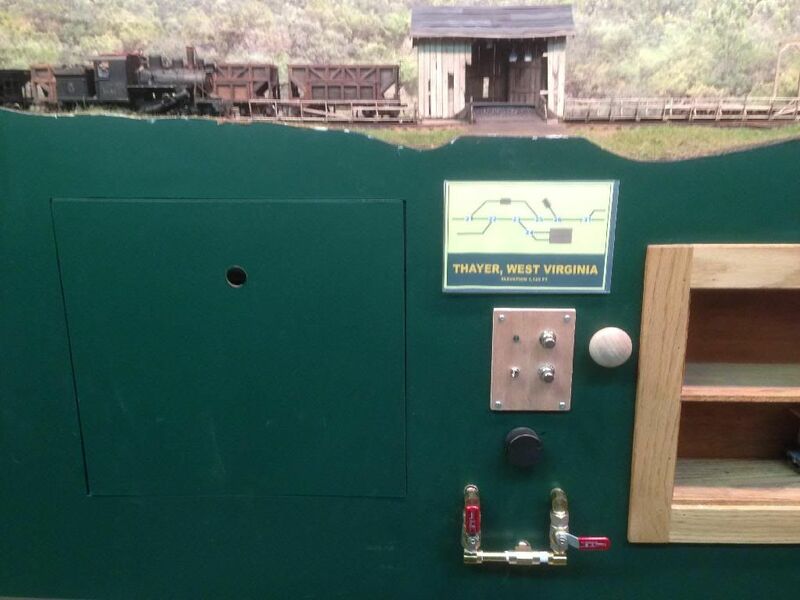 When a train enters the coal dump trestle for the coal sizing plant the toggle switch is thrown to the left and the ball valve on the left is opened (lever up). Then the top button is pushed and the hopper cars doors open. 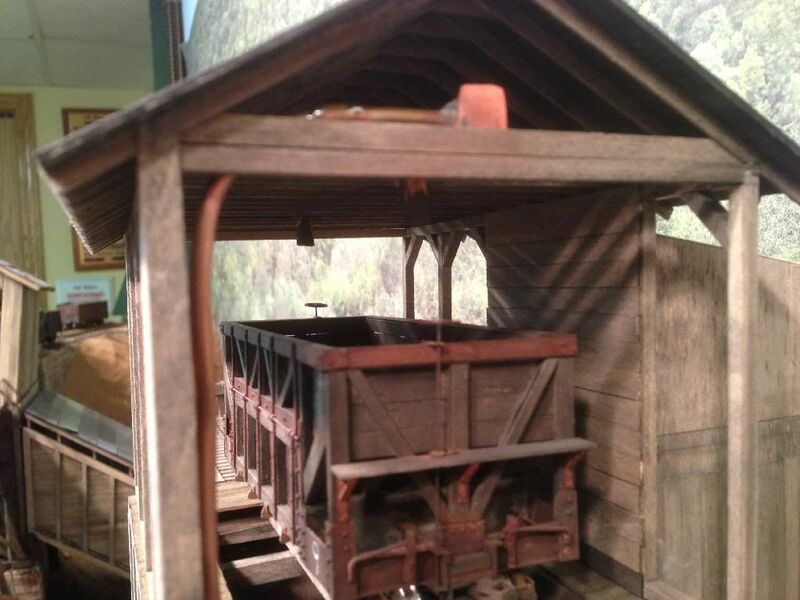 when the coal stops flowing out of the hopper car the wooden (will be painted) knob is pulled and a light shot of air is shot into the hopper car to push out the remaining coal. The bottom button is then pushed and the doors close. The process of button and air blast is repeated for every car and when the train is done unloading the air valve is shut off. 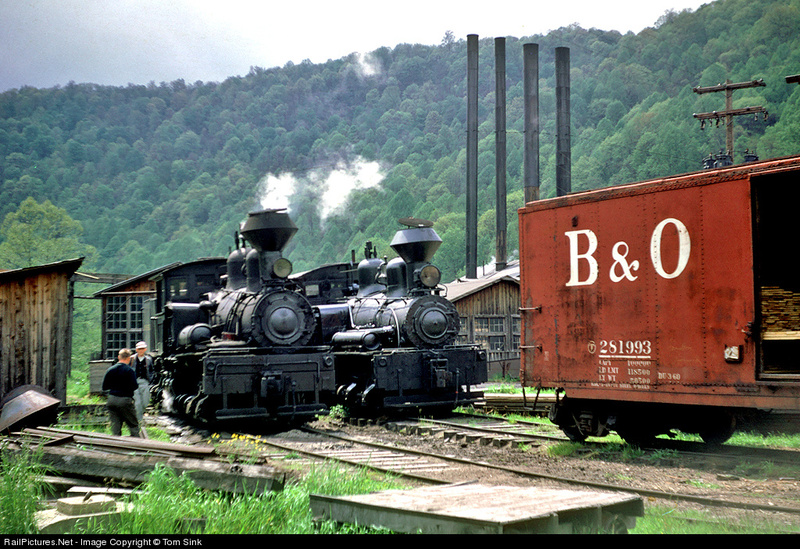 When a hopper car needs to be dumped into the coke coal bin the toggle switch is thrown to the right and the ball valve on the right is opened. The same door buttons and air knob are used for both unloading trestles. I reused all the same controls to save space and to keep from having to make two sets of controls. I could have let air blow out of both dump houses and not had the toggle switch to select which dump house but I wanted to be able to shut them off so I could have cars spotted on those tracks without them being effected by unloading at the other trestle. The black knob adjust the power to the hopper car doors, it was added when I was testing how much power I needed to open the doors without being too much and slamming them open. At first I was going to just leave the adjustment pot behind the fascia but I found it was nice to have it out front for those (now rare) moments when a small piece of coal makes the doors stick, you can bump up the power and either power the doors open or power them closed, whichever is needed, then the knob can be set back to the black line which is the normal setting. The grass is looking good! I like the bits growing between the ties here and there. I got the roof trusses installed and the air duct in the second dump shed and started the siding process. should be close to having it all wrapped up by next weekend, then I have switch gears to an HO depot scratch build I have to get done, and it is hot rod season and I have to get some more work done on the Nova. 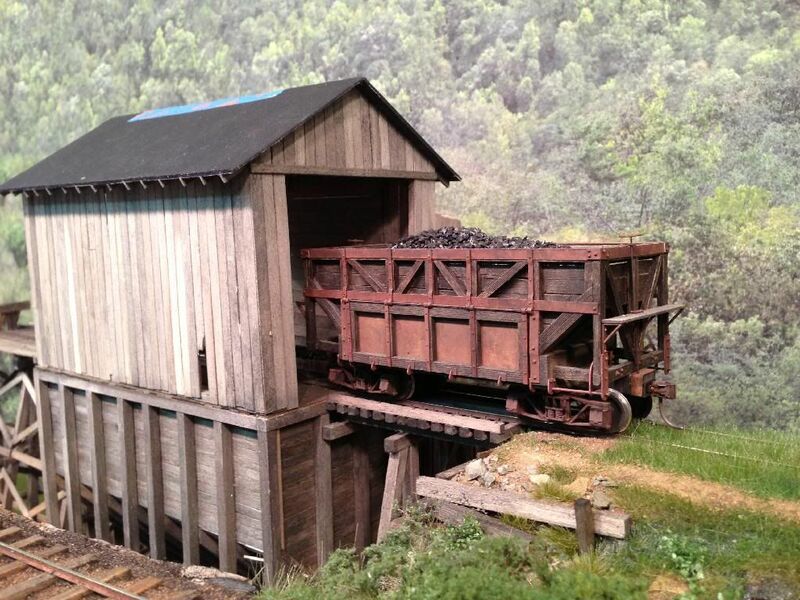 Although the second dump shed is technically older it does not look as bad as the coal dump shed because it did not have the side knocked out of it, which caused the coal shed to sag and lean. This is building up into a very interesting industrial scene. I can imagine what it might be like to be bumping along McKendree Road in the Gorge and come across a scene like this. I would wonder why they built two dumps. And I would wonder why they cut one open for truck delivery but not the other. And I would take about 1000 photos of it because it is so awesome! Do you think you have space to do any development of the scene at the lower grade behind the dumps? thanks Mark. the way I figure it, the didn't need to cut a hole in the shed side for dumping coal into the coke coal bin because demand for coke had dropped due to steel mills making coke on site. Also, the hole in the other shed was cut during WWII because most coal was being processed for shipment (sized and washed). 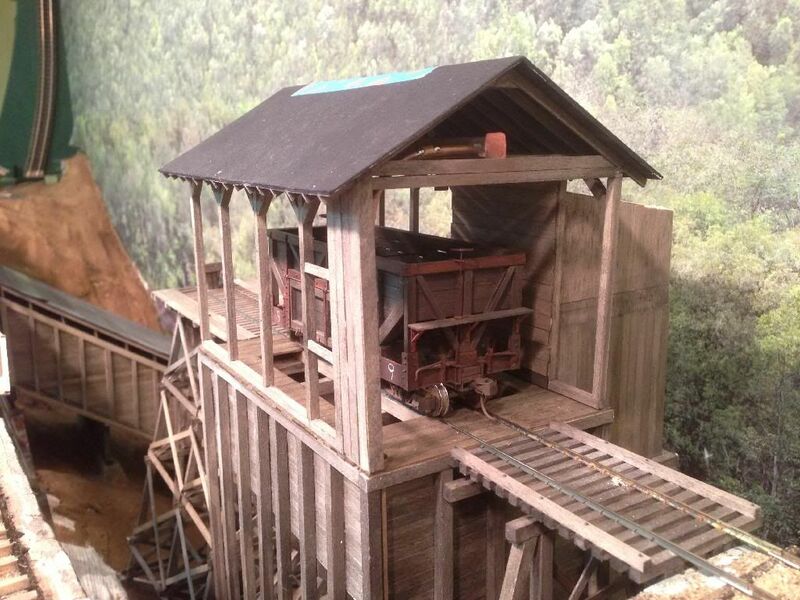 there are two sheds because the coke bin was built first when they were only using the coal for coke production. Later when coke demand dropped a process plant was built next to it. on my RR that meant that a new shed had to be built to get the correct angle for the delivery chute, also at that location the track curved away along the hill side. 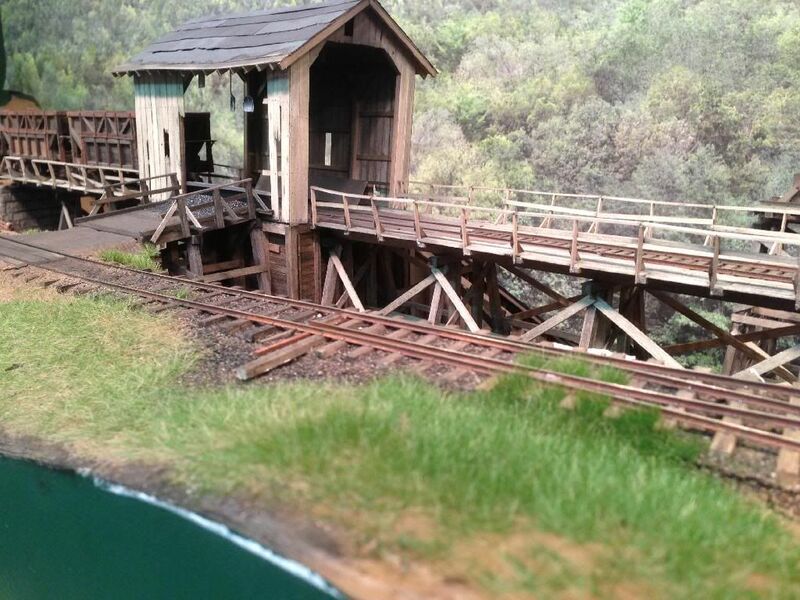 On the Manns Creek the coke shed was first as well but the second shed was built inline with the first and both had a run through track, which I would have done but this darn O scale is pretty big and I don't have the space. 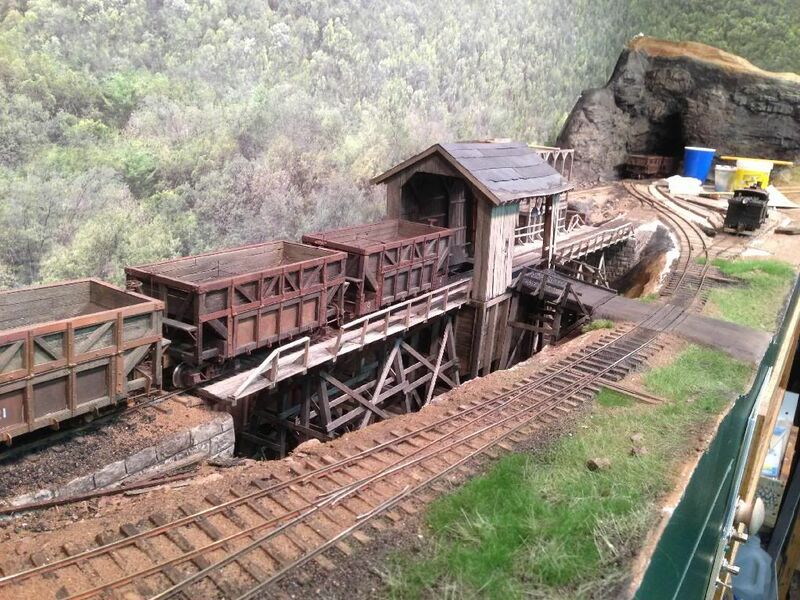 However, the stub siding does provide some interesting switching which will balance the time it takes to dump coal with the time it takes for a second train to pick up hoppers at the mines when I have a second operator. I have no space between the tracks and the backdrop for anything more. I was going to throw in some buildings but with the second dump shed it is already busier than I wanted it to be. I will be stopping construction for a while as soon as I get the shed finished, I will post photos and a video of how it works, then stop until fall. I can't wait until fall (I hate to say that after a winter like we just had, snowed a foot of snow again last night). 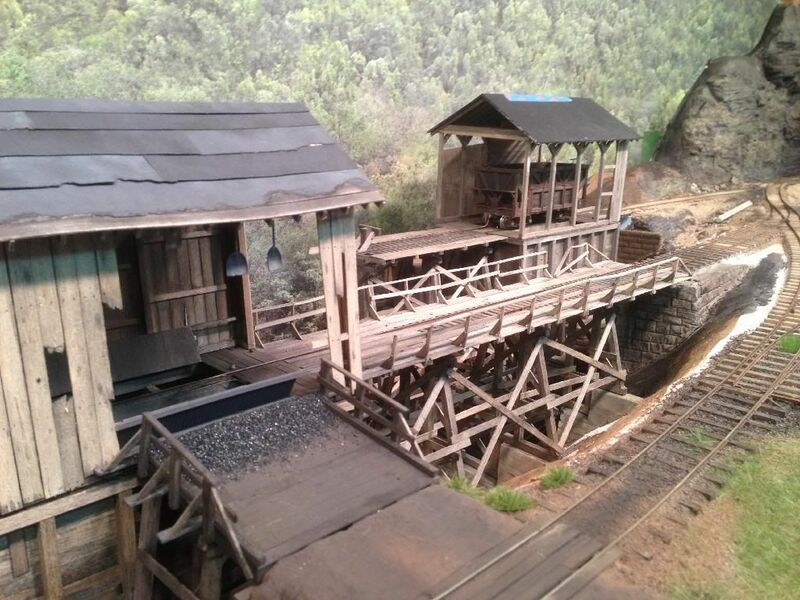 This fall I will be focusing on get the rest of the mine tracks laid and get a tipple loading coal, I have some interesting designs I am working on to automate the coal loading process. Are you posting progress on your Nova somewhere? no, I have not started work on it yet, still cold and snowy here, I hope to get working on it in May. I thought we were going to have nice weather but we got 10" of snow again. we had a huge temperature spike over the weekend and most of it melted away but it looks to get cold again, and since my garage is unheated I have to wait until it stays above 50 for me to feel like working all night in a garage. I also have to wash all the salt off the floor before I get out my old car, and I can't do that until it stays above freezing, otherwise I will turn my driveway into a skating rink. 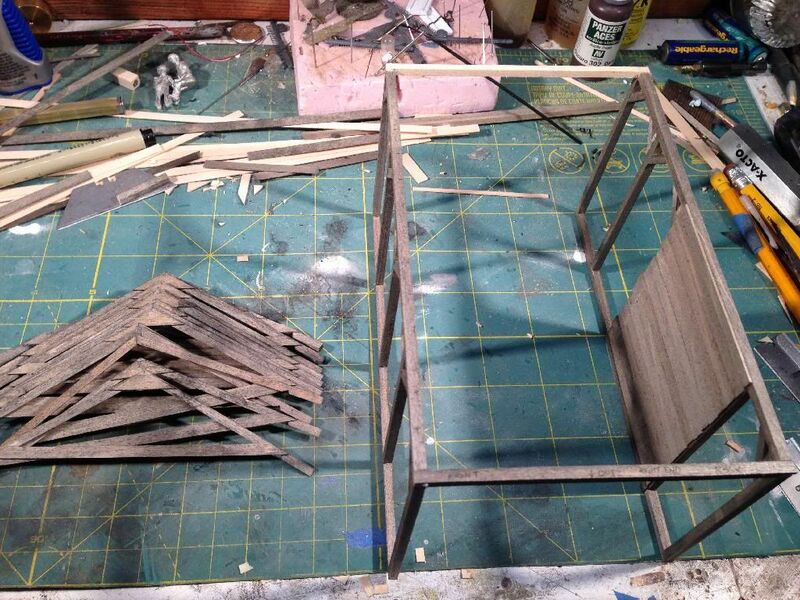 the shed has all the siding on, still have to add nail holes and touch up the broken and rotten boards and do the final weathering. I should have the roof done next week and then all that will be left is the hand rails on the walk ways. Operating this shed is a bit odd without the hole in the side like the other shed has, you pretty much operate in the blind. I really makes me appreciate my choice to orientate this scene with the operator standing on the hill rather than the normal choice to be looking up hill. I can live with the coke shed being odd to operate because on a few cars will be dumped there in a session. I have been playing around some with scenery materials next to the shed. I will post more photos of the results when I feel it is finished.